Christmas Program 2018 - Starry Night, Noisy Night! Starry Night_Noisy Night from Cathy Lundgren on Vimeo. SUNDAY SCHOOL meets each Sunday 10:30 - 11:30. We register three year olds (potty trained) through grade six. 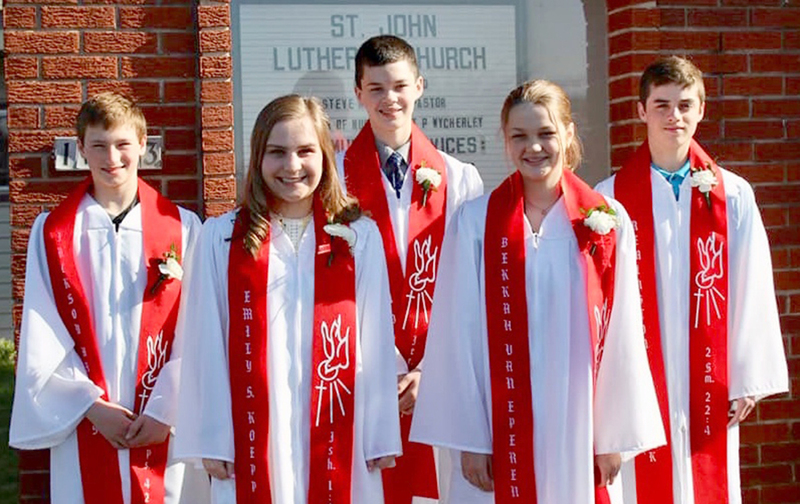 There is also a class for confirmation students who are in seventh and eigth grades. Call Trudy Linssen 715-850-0145 or Cathy Lundgren 715-850-1798 to register or receive more information. Our offerings support the L.A.M.P. mission which funds the missionary pilots and their planes who fly into remote areas of Canada with the Gospel message. We also support the two projects listed below. There will be a Christmas program Wednesday, December 19th, 5:30 at church. This year the program is yet to be determined. Children sing in church once a month. HEARTS FOR JESUS project is announced around Valentines Day with the collection drive continuing through March. Each year is a diffent ministry to support. OPERATION CHRISTMAS CHILD is an annual event to pack gifts in shoeboxes and have them shipped to needy children throughout the world. From time to time we have fund raisers for postage to mail the boxes. They are distributed through the Franklin Graham Ministries. The VBS summer offering went toward this project. Packing day is for the students, families, and worshipers. It was Sunday, Novemebr 12, 10:30. CAMP LUTHER: Each spring we subsidize our students going to Camp Luther. Applications are available in March. APPROXIMATELY 200 people attended the children's musical Solomon's Cut Above. Thank you Alena Collins for this video! Meeting time of 7 am each Wednesday morning. We are currently studying First John. Moderator is Ron Runge. Breakfast Bible Class has about 10 participants and welcomes anyone who would like to join us for a hot breakfast, coffee, discussing the Word, and prayer. We also collect a dollar a week to help with special needs in the community, and we send greeting cards to those who need encouragement. For further information about the class, talk to Scott or Pastor. Thursday 10 am: Study of the Sunday readings. Thursday evening class led by Dan Martin. First and third Thursdays 6 pm. Women of Grace Bible Class meets the third Monday at 4:30 pm.